Please don't plagiarise from any other site, unless you have permission to do so. Not necessary that you post lengthy reviews, a small summary of 5-6 lines would do just fine too. Please rate the film out of 5. How is this biggest film? plz explain. R u referring to budget, quality or box office?. Indian movies are not even released in bangaldesh. So how can u sit there and say a south film is India's biggest film?. There is some 4-5 reason why it is the biggest Indian film. 2) The hype and craze of this film is biggest ever in whole india lavel rather then only south, advance bookings of Hindi version proved it. It is challenging Dhoom 3 non holiday record even being a South film. 3) The film getting the highest ever release size in overseas markets for first phase itself, around 2500 screens(almost double from previous highest) and the advance booking is terrific there because the presentation way of this film infront of the world is biggest ever. 4) The budget and the quality of this franchise is best ever for a Indian film and Indian audience widely appreciated it again n again be it in theatre(1st part) or tv premier or social media. that's why the hype and craze is such huge. 5) It is the only film which can earn 500cr nett and 700cr gross in Domestic itself right now without any holiday if it get positive wom like Bahubali and no other film(except Bahubali 3) in this decade has this much potential even with best wom & festival release. The film continues from where the prequel ended. Amarendra Bahubali (Prabhas) touted to be the next king is asked to mingle with his subjects in disguise and know their problems before his coronation ceremony by Rajamatha Sivagami (Ramya Krishnan). This journey leads him directly to Devasena (Anushka Shetty) and they fall in love. Back at home, Bhallaladeva (Rana Daggubati) and Bijjaladeva (Nasser) continue to plot their revenge against Bahubali. Whether Bahubali takes over the throne or not? and the much awaited Why Kattappa killed Bahubali? is answered in this prolonged flashback. Post flashback it's all routine story of how Mahendra Bahubali aka Sivudu (Prabhas) avenges his father's death and saves his mother as well as the kingdom itself from Bhallaladeva. The first half really starts off on a high note with the established characters. SS Rajamouli is the best person to glorify the hero and with this scale, watching Amarendra Bahubali (Prabhas) showcase his skills is a treat indeed. The introduction of Devasena (Anushka Shetty) establishes her character of a no non-sense princess who is a true warrior by herself. A right match for Bahubali, It's a love at first sight and the follow up events laced with humour makes the flow pretty smooth. At it's core, this is a very simple story and SS Rajamouli knows how to present it. As Bahubali and Devasena fall in love, Bhallaladeva (Rana Daggubati) conspires to use this for his advantage. This covers the plot about who succeeds to get the throne. The interval block is emotionally high and of course along with Mahishmathi, even the audience would hold their breath considering the only unanswered question left to be Why Kattappa Killed Bahubali? Second half has Amarendra Bahubali's flashback continue and the emotional angle is kept intact. The reason why Kattappa killed Bahubali might sound simple but the way SS Rajamouli builds up the scenes leading to the major reveal, shows his caliber. He succeeds in grabbing our attention throughout. Post this big reveal, the final battle in the second half again relies on the grandeur and CGI. The pace slows down post the reveal and the story becomes extremely predictable. And when it comes to heroism, Rajamouli is not the one to hold back. All such scenes totally play to the gallery and this old school treatment keeps the final act in a safe zone, ending this mammoth dream on a predictable note. Prabhas is good as Amarendra Bahubali and he lives that character. Sadly we don't get to differentiate between his two characters rather we are left with one option of accepting them as "like father, like son", as established in the prequel. 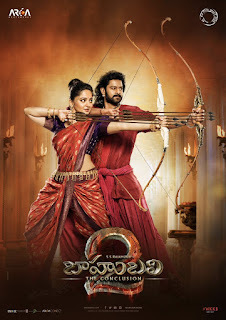 Anushka Shetty gets a superb introduction and ably supports Prabhas in the first half. In the second half, she gets sidelined. Tamannaah is hardly there in the sequel, while you hardly get a glimpse of her. Rana Daggubati excels as the baddie. His efforts show on screen. In fact both Prabhas and Rana complement each other very well. Nasser is first rate. Subbaraju as a comic relief succeeds in bringing in the chuckles. Special mention to Ramya Krishnan as Sivagami and Sathyaraj as Kattappa who actually shine in this film. While, Ramya Krishnan looks majestic, she comes up with a fantastic performance. Sathyaraj gets to show his comic talent in the first half. He has given a commendable performance especially in the scenes leading to revealing why he killed Bahubali. It's their performances that stand out. 1. The grandeur and the epic scale of the film. 2. SS Rajamouli's vision continues to keep the audience captivated. 3. The humour in the first half. 4. The hero elevation scenes as well as the scenes glorifying Prabhas as Amarendra Bahubali. 5. Devasena's introduction and the scenes where she confronts Sivagami. 6. The battle with the Pindaris. 8. The scenes leading to Bahubali's kill. 1. The rope work during the action scenes stick out as sore thumb. 2. Songs act as speed-breakers. Apart from Dandalayya and songs from the prequel, rest don't impress. 3. Post the reveal, the film becomes extremely predictable. 4. The final battle between Mahendra Bahubali and Bhallaladeva has very little to offer and is no match to the battle scene in the prequel. It feels like a drag. 5. Once the flashback ends, the film gets least convincing. Final Words - I would be proud to have this film representing Indian Cinema. Like I said all these are only half praises. The rest of the praises will be showered next year. Watch the film.... OUR FILM. Yup that was my rating for part 1. I would've rated part 2 higher if the last half an hour had offered novelty rather than extremely routine son avenging his father action sequences. If you're not into the film in the last half an hour then it will feel like a drag. No complaints till the flashback ends which takes major part of the film. @fuad Hasan .. no it's not. Atleast if the final battle between Prabhas & Rana as fun as the battle with kalakeyas in part 1 then it would've been a lot better. Instead it turns into a routine hero-villain fight with super powers to bring down a statue with just their punches. This one is not epic like the first one. War tactics are not as good as the first one. Visually it is very good just like the first one but the story is very predictable. It will probably not trend as well as the first one. I watched part 1 multiple times but I dont think i will watxh this one again. Still an entertaining movie though. A fitting finale to arguably India's biggest film ever. The story continues from where it left and it keeps getting more and more tense with each frame. The pre interval and post interval sequences are amazing. The reasons behind the film's main secret and the events leading upto it are very explained. The climax for me was a bit of a letdown with a lot of OTT thrown in. Prabhas is first rate and rana is amazingly menacing. Anushka shetty looks beautiful in the 1st half and acts very well too. A big big thumbs up to rajamouli.....this epic scale and canvas is not easy to acheive. The film is tiring especially towards the end, one starts to feel weary at times, but the conclusion is well worth and satisfying. Awesome movie...Although not as good as first one. 4/5. Baar baar dekhenge...Jai Mahishmati. Sharafat tumlogo ko ascha nhi lagta.... Isme 'Lallu' kaha se aa gaya? Ab agar main ***** ya BAKRI bolunga toh tujhe ascha lagega kya? Kya karein ab. Lallu ko lallu bolne ki aadat si ho gayi hai. Won't write a review as most would have already read a lot of reviews of the movie or probably watched the movie themselves. Compared to the first movie, it is a let down. But as first one was a 5/5 material and you can't repeat history again and again. It still was one hell of a ride and complete entertainer. At first I had high expectations and hence I was finding flaws in the movie like over the top logicless action and all. But after half an hour I decided to just enjoy the movie rather than analysing it. Then I liked it to the core. So I would just like to say that while going in don't expect an epic, and then you can get an epic, else you will cringe throughout the movie comparing it to the 1st one. Final rating - 4/5 - Hugely entertaining. Made for pan Indian audience with everything for everyone. Just go and enjoy. And don't miss it in theatre as it deserves to be seen on big screen at any cost. Why always we need a content rich sensible movie... Why cant we enjoy a visual treat with world class entertainment... Baahubali 2 clearly lives up to the hype when it comes to pure entertainment. Yes, its not a great cinema, but certainly its a cinematic experience which is worth enjoying. When I watched Baahubali The Beginning, I wasn't sure what to rate.. I was in awe due to its massive production scale and beautiful visuals, but yes I found it nothing exceptional story wise. Baahubali 2 on the other hand having much more to offer... So much more that you feel some scenes are over the top, and yes they are... But that is the vision of one man, S.S Rajamouli. He had delivered many sensible movies over the years, and now he tried with an epic fantasy movie that made him the biggest director of India. His capability having no limits. He could have made Baahubali as a LOTR or GOT, but then would we be having this phenomena today known as Baahubali? I request everyone to neglect its flaws, Baahubali 2 is filled with flaws, but if you don't try to be too critical about the movie and enjoy it the way you enjoy when Harry shows his flying skills, standing on a stick to catch a ball having wings, it will eventually turn out to be something you have never seen in Indian movie and most probably you wouldn't see in next 5 years at least. I am not going to rate the movie.. Its not a film, its an experience..go and enjoy this giant movie which made a non holiday release as a festive weekend. Though the only complaint from me would be that the war scenes that is not up to the mark with the prequel. But then again, you can not repeat something like that with your each movie, and Baahubali 2 has much more war sequences than Baahubali. Sirf weekend ka game hai..
this film towards the end feels like a parody with all the "war tactics" and soldiers flying. without spoiling much this is how the movie plays out its action sequences. Yup. The final battle fell flat for that sole reason. Baahubali 1 had properly presented the battle in 2nd half & we were even shown them train. So those tactics worked & all the soldiers following those tactics were believable. But here, the son is no trained warrior. Just coz he's the son of Bahubali he thinks like him & comes up with his planning. None of the soldiers have trained with him & still they pull it off in one try. The main problem was that once the flashback ended, time was not provided for the events to sync in. Instead right away the son declares war which just doesn't make sense with less soldiers, no training, no tactic etc. Basically they were never a team & yet pull it off. Couldn't agree more. And tamanas role Saab reduced to a 10 second appearance. Flashback was too long. Itna jyaada expectations kyu rakhneka phir!!!! Baahubali 2 is a perfect entertainer this summer and it's worth the money.In other words full paisa wasool movie.It starts with the flashback of the prequel.The 1st half is more about the love story of Baahubali and Devsena.And it's just so beautiful.Its full of romance,comedy and some fights.Then comes the main reason why we are watching the movie,Why Katappa Killed Baahubali!!!! The way they have explained it and the reason why he was killed was done in brilliant way.After that it's about Amarendra vs Ballaldeva.The climax fight is good and long.You will definitely enjoy it.Comin to performances all lead cast like Prabhas,Rana,Sathyaraj do full justice to their roles.Prabhas is better is Baahubali than Shiva.The real show stealers are Ramya and Anushka.They are just perfect and a treat to watch.The action scenes are just fantastic although at the the nd somewhat illogical.Coming to direction and cinematography, SS Rajamauli take a bow.He takes Indian cinema to whole new level. Just epic.VFX is just fantastic as you can see in the war scenes.Every frame of movie looks grand and with lavish sets.Just like Prequel.A must watch once in a lifetime movie.Highly recommended.My rating 4.5/5. It went from an epic to a regular south movie. Too much OTT action. Lack of goosebumps scenes as opposed to the first part. Its a one time flick. Does not match its predecessor in any way! Same thing one of my friend said! guys have given detailed explanation. first half is very good. the grandeurness, the humor, chemistry between baahubali and devasena, great performances by shivagami and kattapa. The lord like stature of baahubali, that scenic beauty. In 2nd half there is not much too offer.simple reason to kill bahhubali by kattappa. big disappointment is the battle scene between shiva and ballaladeva. The heroics by both shiva and ballaladeva. The rope scene and chain breaking scene. Final battle should have been much better. He should have cut down 2 songs and given that time to 2nd half. He should have further made changes in preparation of final war. As an nationalist I was lost in the first half, imaging the ancient past of my country. 4.5/5 For the first half, 2/5 for 2nd half. Go and enjoy the grandeourness. which one is better acc to you?this one or the 1st one? Somethings I do for love. It may be flawed may be anything but I loved. Bahubali 2 - The Conclusion four weeks worldwide collection. India's one & only 1000cr domestic grosser. Presenting trailer of India's Biggest film ever Baahubali 2: The Conclusion.